US retail ecommerce sales jumped 17.8% during the 2016 holiday season, a phenomenal rate that helped push total retail sales up 4.8%. For the 2017 holiday season, eMarketer expects ecommerce to climb 15.8%, while total retail growth will slow to 2.0%. Ecommerce accounted for a record 10.6% of total retail sales in the US during the 2016 holiday season. Falling foot traffic continues to plague traditional retailers. According to one study, foot traffic was down 12.3% in November and December 2016. Mobile commerce continued to expand in 2016. comScore Inc. estimated that US holiday season retail ecommerce sales on its platform increased 44% last year, accounting for 21% of total ecommerce for Q4 2016. Other providers reported an even higher mobile share of sales. The core holiday season began even earlier in 2016, with major Black Friday sales starting the week before Thanksgiving. The online season also ran closer to Christmas, with both consumers and retailers more confident in the ability to have products shipped in time. The convergence between physical and online shopping continued during the 2016 holiday season, with more ads driving foot traffic and more online services enhancing the in-store experience. Amazon continues to dominate the ecommerce landscape. 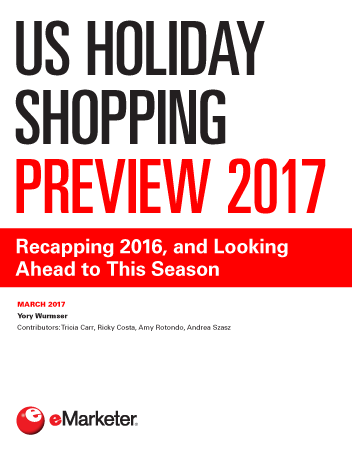 According to one study, 38.0% of US retail ecommerce sales during the 2016 holiday season took place on Amazon, with the percentage increasing as the season progressed. "The gap between holiday season ecommerce sales growth and total retail sales growth in the US was 13 percentage points in 2016, down 1 percentage point from 2015."